Good employee morale is vital to creating a productive, efficient workplace. 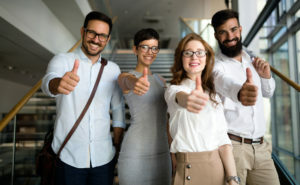 One of the easiest methods you can use to boost morale around the office is by utilizing professional janitorial services, such as South Jan in Columbia, SC, to create a clean and sanitary working environment. Workers generally spend nearly as much time at the office as they do at home – meaning it is important that employees are just as comfortable at the office as they are at home. Furthermore, a clean office is sure to reduce the risk of employees getting sick and prevent them from feeling discouraged by constantly having to take time to clean the office themselves. Choosing the right cleaning service for your office is very important. The service that you choose needs to be efficient, quick, and trustworthy. The service that you choose is going to need to have access to any and all parts of your workplace in order to complete their job. As a result, you are going to want to have complete trust in them so that you are not left worrying that they might damage or steal something. One of the easiest ways to ensure trustworthiness is to consider hiring a local cleaning company. Local cleaning companies are going to be more dedicated to their customers than a chain or a company owned by a larger corporation. Local companies rely on creating strong relationships with clients in order to continue to grow and have steady business. As a result, they are much less likely to potentially damage customer relationships by haphazardly completing their job. When deciding between professional janitorial services, make sure to look for ones which have a good reputation, and have many positive referrals. Additionally, ensure that the service that you choose guarantees to take responsibility for any broken or stolen items. By following these guidelines, you can be sure that the service you choose is going to clean your office to perfection every time, and you won’t have to worry about letting them near important work-related materials. When making a change to workplace operations, it is always best to consult your employees for their opinions. Ask them which services they view to be the most important, which areas of the office should be prioritized, and if they can recommend any companies. If you plan on boosting morale, it is vital that you take the concerns of your workforce into consideration. Once the janitorial service has been hired, and has been to the office a few times, ask your employees what they think of the cleaning company, and if there is anything that could be done better. By consulting your employees, you can ensure that all of their needs with regards to office cleanliness are being met. Office cleanliness is a very important factor to consider when trying to increase employee morale. By following the guidelines laid out in this article, you can be sure that you find the perfect company to service your office. If your office is located in the Columbia, SC area and you are interested in hiring a professional janitorial service, feel free to contact us.